Ever wanted to know how to get those little badge icons on your profile....? From the Llama's to the wears a tinfoil hat, this is a group that will help you get them with all the latest news and updates!! Add this group to your +watch to get notified of new deviantART badges when they come out. All badge fanatics are welcome to join. 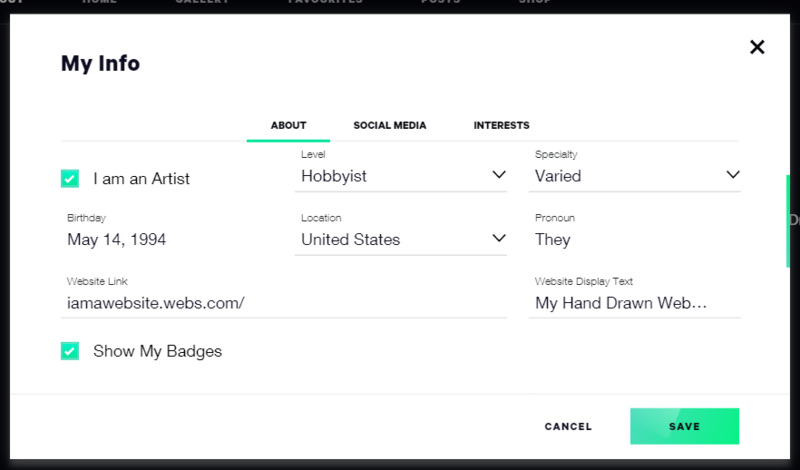 Badges are icons that can be added to your personal profile (visible at the top right of your page). Below are listed all the known types of badges, including how to obtain them. Not all badges are publicly available and some have been discontinued. 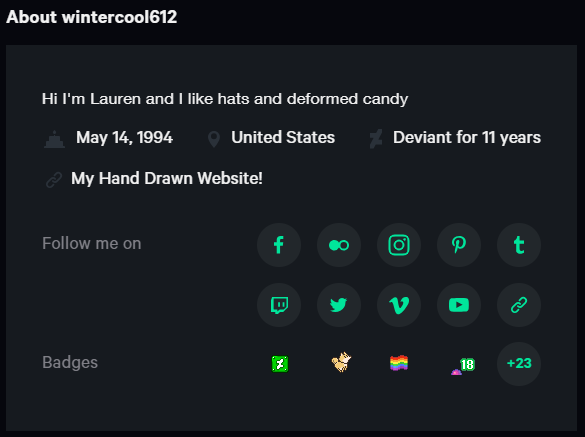 All badges (except llama and cake) are given by devart, a deviantART System Bot. Because devart is not a human that account can't answer to your questions about the different badges. 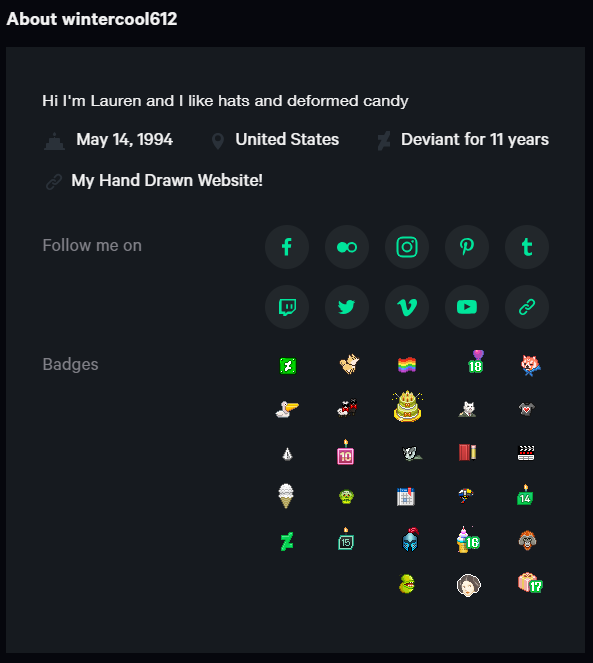 Also deviantART admins can give some other badges than just llamas and cakes. This group can't give any badges because we are not deviantART admins. Badges can be removed from your account if you contact the help desk. Only your first two featured badges are visible in the mobile version of the site. If you want to remove all featured badges from your profile page go to: me.deviantart.com/badges/ There is a link 'Clear all featured badges'. If you want to remove all badge notifications go to www.deviantart.com/settings/ge… and choose 'Disable message center notifications for badges'. A group can have badges besides llamas and cakes if it was converted from a regular dA account using convertaclub before July 4th, 2010. Click here for proof. Click here to give this group a llama. Click here to create a link like this for yourself. Click on each badge image for an example. The 'Blind to Pageviews' distinction is given when a user chooses to hide pageviews from being displayed on all profile pages (this option is in Settings >> Browsing - Take the ✔ away behind Pageviews Display). If a user has five other badges publicly visible, enabling this one will add a sixth 'badge' to the top right of the user's profile page. If you want to see the pageviews again this 'badge' will disappear. Llamas can be given to other users through the Give menu found at the top of the user profile or through llamatrade. To give one to a group, click here for how to give that first important llama out. Give llamas with only one click using this tool. All deviantART users can collect up to 100,000 llamas, with the exception of glitches. You can choose which unlocked llama level is featured in your profile page. Go to your llama badge page and click the llama level that you want to use. If you have any questions about the llama badges the best place to ask them is llamalist. If you'd like to learn more about llama badges, please click here. You can take off the sunglasses and the bowtie or put them on back to your llama. ??? (Mystery Llama) is a placeholder in your badge's page for the next level you haven't achieved. It applies to all badges with levels, the exception being cake. Click here for proof. Cakes can be purchased through the Give menu found at the top of the user profile for 80 . Hover over each cake image for its accompanying quote. If you'd like to learn more about cake badges, please click here. Solve the puzzle and submit your score. Best times can be viewed here. Worst times can be viewed here. Originally an inside joke among the staff, this badge is granted to anyone who purchases a product (mug, postcard, print, puzzle, etc) of this deviation: makepictures.deviantart.com/ar…. You will get the badge when the item that you ordered is shipped to you (the shipping can take few days). Note, while multiple badge can be acquired by a single user (like the llama badge), the badge does not level up (change appearance after 10 badges), the badge simply lists how many a single user has accumulated ioulaum.deviantart.com/badges/…. To acquire this badge, submit a piece of art to the "Community Projects / Holidays / 2016 / 16th Birthday" category. This badge is given to everyone who solves the ARG puzzle presented by iblis and AriBanks. The Fella Badge was given to deviants who submitted an entry to the Fella Around The World contest: deviantwear.deviantart.com/jou…. This badge was given to people who read this article and submitted a cat-related art to the category Community Projects > Projects & Clubs > Free Fella. Given to users who purchased Muro brushes prior to November 20th, 2012. As of this date Muro brushes are now free. The white boxes are now removed from the journal. This badge was not given to the people who only submitted art to the thoughtART category. This badge introduced the new logo of deviantART. This badge was given to people who clicked this link. A Fella character appeared on the front page of deviantART and you were able to use the right and left arrow keys to navigate the character to the bottom of the screen. This badge was given to people who submitted a piece of art to the "DeviantART Related / Biting Pear of Salamanca" category. This badge was given to those who submitted an eligible deviation to the The Fan Art Mashup Challenge before October 19th, 2017. Badges were awarded October 25th, 2017, despite the journal promising the 22nd. This badge is specifically for :devdevbug: Alpha Testers, celebrating two years of operation. In April 2013 the new Alpha Testers also got those badges. @devbug also has this badge. Given to users who demonstrate a significant bug in deviantART's design. These badges don't stack so instead of displaying only one badge multiple Dead Fellas are displayed separately. Original Staff Merit badges "badges started out as merit badges for deviantART staff. They were only available to staff for special accomplishments like merit badges for the boy scouts. We started making them available to members by way of special events like our 10th birthday bash and hidden pageviews. They gained a lot of popularity about 3 years ago with the introduction of the llama badge system for our annual April fools prank. The rest is history, you guys can't seem to get enough of them. " FAQ #324: What do the Staff Merit Badges stand for? A merit badge given to staff members who go to sleep with the sleep flag enabled. The dA development system has a setting so that when a sleep flag is enabled (eg, when a developer is testing/fixing code and doesn't want outside interference), no other developers can introduce new code to the site. This badge is given to developers who do not disable the flag before they go to sleep at night (and thus no new code can be tested/fixed that night). There is also a "King of Sleep Flags" badge, for earning the Sleep Flag badge 20 or more times. This badge is specifically for DEVlANT for exploiting a glitch in the llama system. Also other DEVlANT's accounts have that badge, for example logon. Eclipse is the new version of deviantART. It's still a work in progress. Anyone with a core membership can gain access to it. To get it go to your settings page and make yourself a beta tester. You'll be able to click here to switch to the new site. Click the link again to switch back to the old site. You have to click the +23 button to see my remaining badges. DO NOT leave a comment on the group's profile page asking for badges or points. While we permit questions about how to obtain badges, we do not tolerate the stream of people begging for badges. This group is designed to provide information on how to obtain badges, not act as a springboard for self promotion. Please respect our group and submit your requests elsewhere. Please let us know if you catch any badges being no longer available so we can update our list. This group only accepts art that has something to do with any dA badge listed on the left of this page. Is there any instructions on how to solve the Red Panda puzzle? about the Iblis and Aribanks puzzle, may I have the instructions? I'd love to participate! No clues about how to solve the ARG Puzzle for Bunny the Red Panda Badge. Can I have a little help, please? 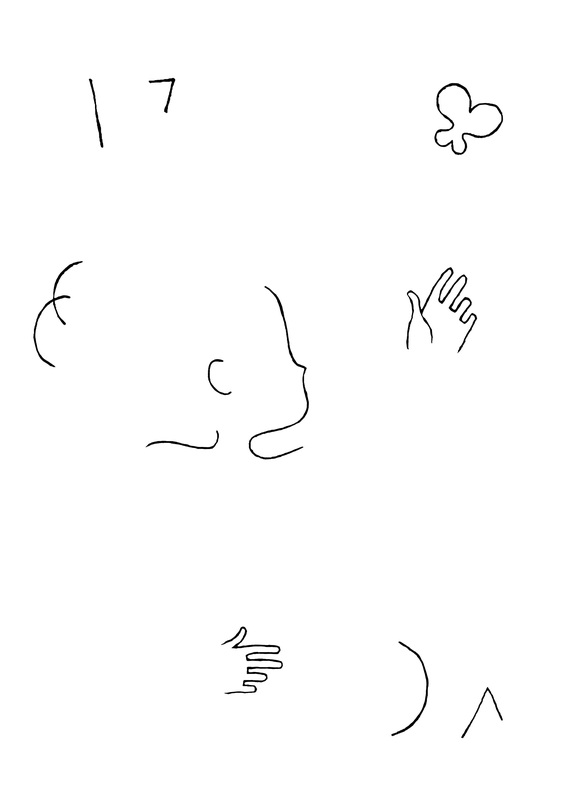 I sent a note. Please do not share it. Sent me a note too, please. How to solve the ARG Puzzle for Bunny the Red Panda Badge? I'm stuck, Please help. how to solve the ARG puzzle presented by iblis and AriBanks? I don't really get how I'm supposed to get the red panda. Can someone dumb it down for me?